Harvard scientists are using a genetically modified version of the rabies virus to trace neural pathways in the brain, believing that this research may lead to a better understanding of how Parkinson’s disease and other motor-control disorders are affected by problems with dopamine neurons. A genetically modified version of the rabies virus is helping scientists at Harvard to trace neural pathways in the brain, a research effort that could help lead to treatments for Parkinson’s disease and addiction. 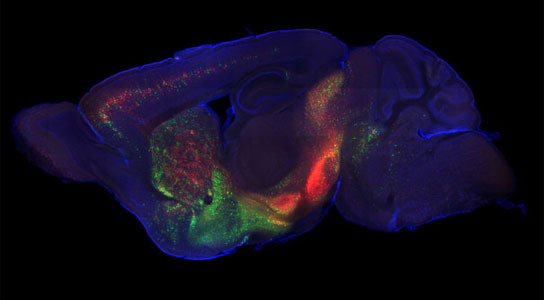 As described in a paper published on June 7 in the journal Neuron, a team of researchers led by Naoshige Uchida, associate professor of molecular and cellular biology, used the virus to create the first comprehensive list of inputs that connect directly to dopamine neurons in two parts of the brain, the ventral tegmental area (VTA), known for processing reward, and the substantia nigra (SNc), known for motor control. Dopamine neurons are believed to be important for processing reward and regulating motor output. Creating that connectivity diagram, however, is anything but easy. While both the VTA and SNc have high concentrations of dopamine neurons, Uchida chose to examine both areas because the cells in the two regions fire differently. The challenge, however, is that dopamine neurons are packed into relatively small regions with several other cell types. To ensure they were only observing dopamine neurons, researchers turned to an organism more typically known for damaging neurons: the rabies virus. Before the researchers infect genetically engineered mice with the rabies virus, however, they first injected the animals with a pair of “helper” viruses. The first causes dopamine neurons to produce a receptor protein, meaning that the rabies virus can only infect dopamine neurons, while the second restores the virus’ ability to “hop” from one neuron to another. The mice are then infected with a version of the rabies virus that has been genetically modified to produce a fluorescent protein, allowing researchers to track the virus as it binds with dopamine neurons, and then jumps to the cells that link directly to those neurons. The results, as seen in images of a mouse’s brain depicting the wealth of connections to dopamine neurons, show that a number of brain regions — including some previously unknown areas — are connected to dopamine neurons. “We found some new connections, and we found some that we suspected were there, but that were not well understood,” Uchida said. “For example, we found that there are connections between the motor cortex and the SNc, which may be related to SNc dopamine neurons’ role in motor control. Often used as a treatment for Parkinson’s and a variety of other disorders, deep brain stimulation involves implanting a device, called a brain pacemaker, into a patient. The device then electrically stimulates specific regions of the brain, helping to mitigate symptoms of the disease. “The mechanism for why deep brain stimulation works is not completely understood,” Uchida said. “There was speculation that it might have been inhibiting neurons in the subthalamic nucleus. But our findings suggest, because there is a direct connection between those neurons and dopamine neurons in the SNc, that it is actually activating those neurons. I don’t think this explains the entire mechanism for why deep brain stimulation works, but this may be part of it. Funding for the research was provided by the Howard Hughes Medical Institute, the Richard and Susan Smith Family Foundation, the Alfred P. Sloan Foundation, and the Milton Fund. Be the first to comment on "Scientists Use Modified Version Rabies to Trace Neural Pathways in the Brain"